Jasmin Blanc Boutique is the dream of a girl called Erika… a world of pastel colors, feminine shapes and delicate textures. Her main medium is ceramics, yet for certain collections she uses materials such as vintage lace, metal bases and semi-precious beads and pearls. Originally from Romania, she ran away to England to follow her lifes ambition to set up her own craft business. 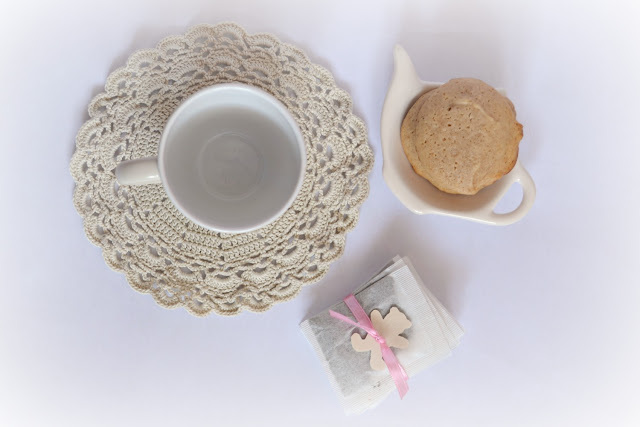 She also runs a blog in which she shares her thought and ideas about ceramics, art, crafts and a simple life. In this tutorial, Erika explains how to give a plain mug a special Jasmin Blanc Boutique touch which makes the perfect present for one you love. We all love gifts, don’t we? So consider that next time you are buying a silly something for someone dear, just to get the burden off of your shoulders. Giving is not that! It is not about just handing it over and that is that. Giving is an act of love, as much at non material “giving”, as at the material one. I always loved making things to give for an occasion. Something that is made with love and dedication will always be a pretty gift, whether your a crafty person or not. So many people say that they are not good at making things, but let’s face it, that is really just nothing more than a lousy excuse to not even trying. So I decided to share with you some gift making ideas for the season. 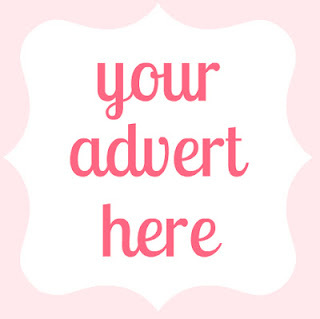 I started with this project on purpose, since it is suitable for anyone, really. I mean, who doesn’t love to start their day with a hot drink, be that coffee, tea or you name it! 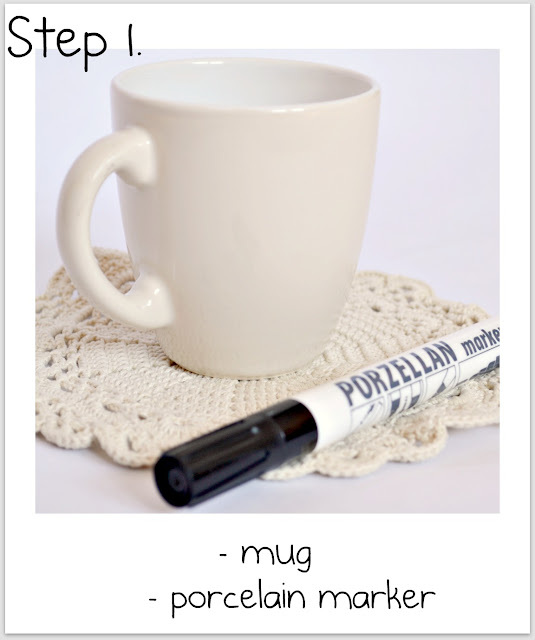 What you will need is a plain mug, that you can find at any supermarket and a porcelain marker. The colors you will use are totally up to you, but if you are making this for someone, you might want to consider their taste in colors. 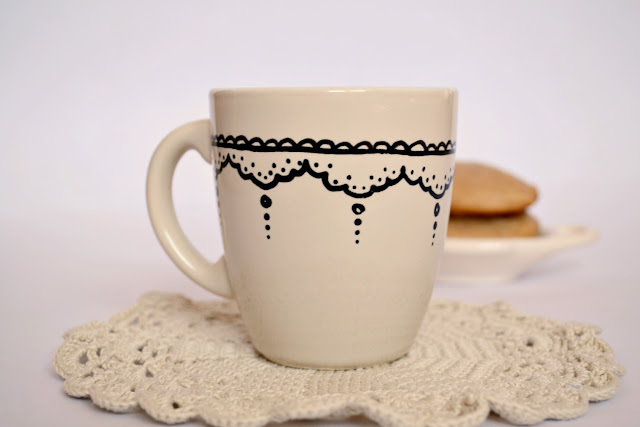 I drew a sweet little lacy-doily pattern on mine, but you can customize it any way you choose. 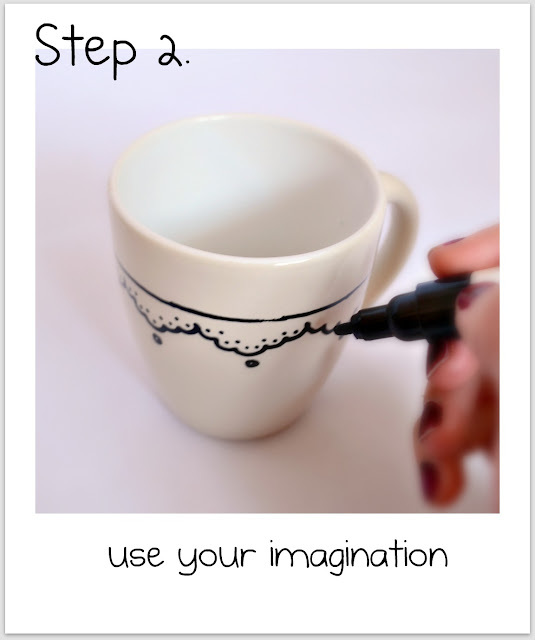 When you’re finished drawing it, put your mug into the oven, and burn it at the advised heat, shown on your pen. Normally it takes 30 minutes at160 Celsius degrees for the paint to dry properly. I would even recommend making a letter-stencil to guide you in drawing, if your not comfortable with straight lines. Say, you could write “M” for mom, which you can print out from your computer in Word, cut it out, fix it to your mug and then simply tint it. So easy!